MsCrookedHalo - Learning. Laughing. Loving. Living. When it comes to Amazon Mechanical Turk (mTurk), you can go it alone to make money or you can utilize the power of forums to work smarter instead of harder to make money on mechanical turk. Most forums have recent hits with other mechanical turk workers letting you know how easy, fast, or even if the requester pays out. mTurk scripts! Scripts can be a godsend even if they make the work a fraction of a second faster. After all, when it comes to doing mTurk, time is money. Most scripts can be found on forums and you can even request help if you can’t get them to work. There usually separate boards to discuss websites similar to mTurk seeking people to complete human intelligence task jobs. These mechanical turk alternatives are a great way to keep the money train rolling when you can’t find any good turk jobs. I do suggest, however, when researching other sites like mechanical turk, that you don’t neglect to see if they have a payout minimum. For example, the pay might be better than mechanical turk but you have to earn $50.00 to cashout as opposed to the $1.00 of mTurk. See the reported income of people who are actively turking for a living. Some report just a few dollars a day, the average is $10 – $20 a day, while a select few blow it out of the water by making hundreds a day. So, what forum do I use? If you google, mturk forum, you can probably find what you seek. But here is a list of 4 forums that I actively use. They are all pretty much interchangeable with the last 2 being a bit more active. I use all 4 because sometimes a hit will be on 1 forum before or not all on another and I am way to busy lazy to look for my own. Do you have any other suggestions for future mTurkers? Or you an mTurker with a question? Leave it in the comments below and I’ll see what we can do. I only use the Atahualpa theme on all of my blogs but I imagine that code works on any website. However, I am no website designer. So, I have no clue where you would put it on your website if you are using anything other than Atahualpa on WordPress. As for Atahualpa, the steps are simple. Click on Atahualpa theme options. Scroll down to Style Widgets. Adjust setting numbers to your preferences. Unfortunately, this is one of those months that has 5 weeks in it rather than 4. This is especially hard for those of us who have to stretch a monthly grocery budget an extra week. For example, if your food budget is $200/month, in a month with just 4 weeks, you can spend $50 at the grocery store. But, that extra week drops you down to just $40/week to purchase the food on your grocery list. Trust me, that extra $10 can make a difference to an already strained budget. One way that I manage to stretch my budget is to see what I can get free from the grocery store (although, I have to say, God Bless my local food pantries and thank you for all that you do!). My next step is to check sites and apps that put out weekly grocery match-up deals. The Lord knows that I am way to lazy to do the matchups myself. My favorite is MoneySavingMom and KrazyCouponLady. These sites match up coupons, deals, and apps to save money. They show you how to get food for as low as possible. Some of the deals are even moneymakers so you can end up making a dollar or two. 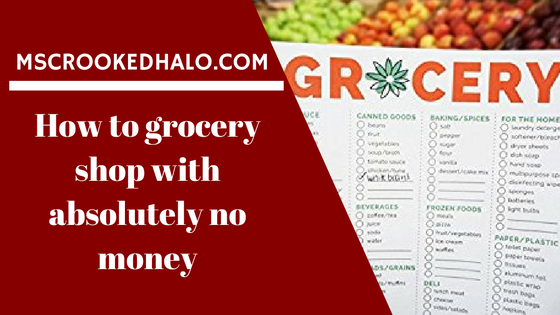 A feature of these sites is that you can quickly and easily add the food to a printable grocery list. The caveat with some of these deals, though, is that you still may have to pay out off pocket and get the money off your next purchase. I signed up to have the emails featuring my local store delivered right to my inbox. One minute step that I take to save a few extra pennies is to walk to the grocery store barring any unforeseen circumstances or weather. I am lucky enough to live in easy walking distance of 3 major grocery stores and 1 Walgreens, and 2 Rite-Aids. All I need now is a CVS and I’ll be all set. My absolute last tip, though, is to not let pride stop you from asking for help. You might need the long-term help of government assistance in the form of food stamps. Or, you just might need to just stretch the budget a bit by going to a food pantry. In this uncertain job market, there is no shame in asking for the help that you need. You can’t eat your pride so you might as well swallow it. Are there ways that I missed to help stretch a budget, especially ways that require no out-of-pocket expense? I love the Atahualpa theme. It is the free theme that I use on absolutely every one of my blogs. But, for someone who does not speak a bit of html code, it can be a struggle to make my blogs pop design-wise. While searching the Atahualpa forum for a solution to one problem, I often stumble across a cool idea. A trick that I have added to each of my blogs in adding round corners to the sidebars (and lately to the content boxes as well). The steps are super simple. Scroll down and click Style Widgets. The latest scam making the rounds is the coca cola car wrap scam. Actually, it could be any well-known company but, at the time that she sent me the link over in Facebook Messenger, it was coca cola. When I clicked on it while writing this post (yes, I clicked the exact same link), the scammers had changed it to Blue Oak Energy. (Here is the link if you are interested. I am not hyperlinking it so you will have to copy and paste. My involvement began when a good friend forwarded me a google document to sign up to put a sign on my vehicle advertising coca cola. For years now, I have been looking for a legitimate “paid to drive” auto wrap company. I know that their are companies that actually do this because their is a car in my local area who I’ve seen with my own 2 eyes painted up in Lucky Charms, Frosted Flakes, and Trix cereal advertisements. Some companies pay you to have your entire car wrapped in their advertisement. While others pay you to simply place their decal on your vehicle. Either way, it is not suppose to interrupt your life and you are to drive around as per your usual. So, I was skeptical because I have seen this scam many times before. But, if it is legit then…Yay, money!! If it is a scam, at least I will know for sure and I can spread the word with this post. In the mail came the check with, you guessed it, the request that I deposit the check, take out my cut, and forward the rest. They even had the nerve to be sloppy enough to send me a letter stating that I signed up to do a Walmart Survey rather than the vinyl door decals that I was expecting. And, oh, don’t be confused by the fact that they didn’t cheap out with mailing it either. So, what would have happened if I had done so. That check would have bounced so high only God would have been able to catch it. And, please, please, share this post. Many people are desperate and do not know any better. The elderly are especially vulnerable to scams. I will admit to haven fallen for scams before. Leave a comment and let me know if you have you ever fallen for a scam? Have you fallen for this or similar scam? And not only my dog. They have hopped from her to my cats. And my cats to my bed. Since I got my long-haired chihuahua Korra a couple of years ago, I have been searching for a natural (and cheap, er, inexpensive) way to help her get rid of fleas and the occasional tick. I have found the solution in coconut oil! Yay! I knew that coconut oil had many health benefits for my personal use and I even replaced using hair grease with coconut oil. But I didn’t know that coconut oil also had health benefits for my pets. Coconut Oil is over 40% lauric acid which has been shown to be preventative against some cancers. Coconut oil kills bacteria, viruses, parasites, yeasts, mange, and fungi. Coconut oil is over 90% saturated fat and has antimicrobial, antibacterial, and antifungal properties. Coconut oil improves bone health, cardio vascular health, weight management, diabetes, and digestion. Coconut oil also has antioxidant properties and it helps in the absorption of other minerals. Coconut oil can be used to improve a variety of conditions, including thyroid, digestion, fatigue and diabetes. Coconut oil reduces symptoms of any dry, itchy skin. Coconut oil can be applied to cracked paw pads, wounds, scratches and cuts as a healing salve. Coconut oil can be used inside the mouth on sores and on teeth as a toothpaste. Coconut oil may also be applied to fungal infections, bites and stings–skin ailments of almost any kind. Slightly warmed coconut oil may be dropped inside your pet’s ears to treat ear mites and infected ears. Coconut oil can help cats to eliminate fur balls. Coconut oil can benefit pets with difficult skin conditions such as eczema, allergy to fleas or other allergies. Coconut oil is safe for your dog or cat to lick off. Your pet may respond negatively to the detox aspect of taking coconut oil including lethargy, headaches, flu-like symptoms, fatigue, and diarrhea. Coconut oil is predominantly made up of medium-chain triglycerides (MCTs)–and MCTs have a negative effect on taste for cats. Coconut Oil MCTs may be a contributing factor to hepatic lipidosis, a life-threatening liver disease in cats and pancreatitis in dogs. With recent popularity of coconut oil, there are many brands hitting the shelves of your local grocery stores. The best type to use, for our pets and ourselves, is 100% extra virgin coconut oil cold pressed from fresh coconut. If you want a coconut oil specifically designed and marketed to pets, there are many brands to be found on Amazon, even coconut oil for horse enthusiasts. I was a bit stupid the first time I put the coconut oil on Korra. Thinking that it was just kill the fleas and, possibly, repel new ones from attaching, I just spread the oil into her fur. I didn’t take into consideration the fact that many of the fleas would make a run for it. You could literally see the fleas jumping for their lives…and onto my bed! Next time, do it in the bathtub or, better yet, outside. Coconut oil know that below a certain temperature it’s solid, and at warmer temps it becomes liquid. However, it melts really quickly when exposed to body or pet heat. I scoop out the coconut oil and applying it everywhere, from the tips of Korra’s ears right down to her toenails. Since Korra is so small, I can easily flip her over and apply the oil to her under-carriage. I apply more to under her chin since fleas like to hide there because it is hard for her to scratch and bite. I give Korra a bath on a weekly basis because she loves to roll around in the dirt when I take her for walks (if I don’t catch her to stop her fast enough) and she is white so it shows if she is not cleaned regularly. Before bathing her, however, I cover her completely in coconut oil right before I walk her. I rub the oil in very well and pay special attention to anywhere heavily infested with fleas. The fleas start dying or jumping ship immediately. After our walk, I take her directly to the bathroom and give her a bath in a mixture of half Dawn dish washing liquid and half vinegar. After her bath, I rub another dab of coconut oil through areas where I still saw fleas. Then I comb the dead fleas out of her fur with a flea comb. On a daily basis, I use to put a few drops of coconut oil in my hands and rub it through my chihuahua’s fur paying special attention to areas where I see fleas or any areas of health concern. Now I keep a spray bottle with 3 parts coconut oil and 1 part vinegar that I spray on her and rub into her fur. During my very first treatment with coconut oil, I also washed all of the bedding and litter box with borax as they were probably infested with fleas. If your pet is heavily infested, you may need to do an overnight treatment. After applying the coconut oil, slip a sweater or coat on your pet to keep the dog from licking it all off. Let the treatment sit overnight and then proceed to wash her. You can do this daily as necessary because unlike the commercial products, this is completely safe to use on most pets. I also vacuumed (and immediately tossed the vacuum waste into the outside garbage container) and shampooed all of my furniture and other areas where the pets normally lay as they might have been infested as well. I also mist my furniture with the spray bottle combination of coconut oil and vinegar. If I still see fleas (or feel them biting me, most likely), I sprinkle a mixture of salt, baking soda, and borax on my furniture and vacuum it up a few days later. If push comes to shove, I put out a few banana peels. Like me to a cheese cake, the fleas are attracted to it but, unfortunately for them, they are allergic to it and it kills them dead. By the way, did you know that fleas can lay dormant for years and even fake death in water. With my method, I do not have to use any flea powders, flea collars, flea drops, or even flea & tick shampoo. I was scared to feed my pets coconut oil without doing some research first to see if it was safe. Especially my kitten, as I thought I read somewhere that it was dangerous for her to consume. But, apparantly, it is as safe to use if given in appropriate doses. Large-medium sized breeds: 1 measuring teaspoon to start, gradually increasing to 1-2 full, generous tablespoon size (measuring or eating type) over the course of 1-2 weeks. Add to food once a day and serve. Small-toy dog breeds and puppies: 1/2 – 1 measuring teaspoon to start, increasing to 1 full tablespoon over the course of 1-2 weeks. Add to food once a day and serve. Adults: 1/2 measuring teaspoon to start, increasing to 1-3 teaspoons over the course of 1-2 weeks. Add to food once a day and serve. Kittens: 1/4 measuring teaspoon to start, increasing to 1 teaspoon over the course of 1 week. Add to food once a day and serve. If your cat won’t eat it in her food, just put a dab of coconut oil on her paw before or after meals. She’ll lick it off and get it that way. For my cat, I put a dab on my own hands and rub it through her fur everyday paying special attention to any areas where I see fleas. I’ve even got my parakeet in on the coconut oil action as I put a drop of oil in her water supply. If you wish to apply topically to use coconut oil to treat a rash, wound or dry skin, but they try to lick it off, try wrapping the skin in a rag or towel for a few minutes to let the oil soak in before they get a chance to lick it off. Why not use medical or over-the-counter flea and tick treatments? I used those remedies for years. Let’s face it, they work. Some better than others but they work. The active ingredients, you know, the stuff that cause them to work, supposedly produce cancer, organ damage, nervous system damage, reproductive damage and skin problems. No more fleas in our beds. No fleas biting me or my daughter. And, most importantly, no more fleas on my dog or my cats. But, an unexpected side effect is that the wheezing that I use to hear from Korra is now completely gone. Have you ever used coconut oil on your pets? Do you use it for yourself? Let me know the results, good or bad, in the comments.